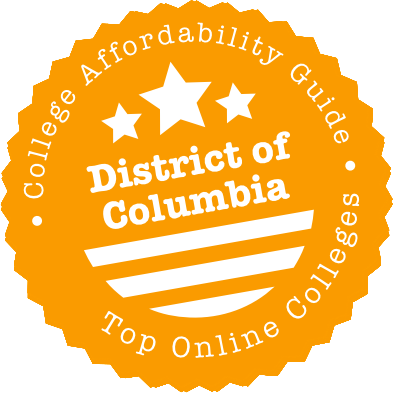 2018 Top Online Colleges in Washington, D.C.
Scroll down to see the top not-for-profit colleges and universities in the District Of Columbia offering online degree programs. More than 60 undergraduate and graduate degrees and over 30 certificate programs are offered online by George Washington University. Students can pursue degrees in arts, business, communications, education and human development, engineering, legal studies, medicine and health sciences, nursing, physical sciences, politics and public policy, public health, and security. The School of Nursing offers four degree programs: RN-BSN (Bachelor of Science in Nursing), RN-BSN Residency, RN-MSN (Master of Science in Nursing), and RN-MSN (Bridge Option). Students who are admitted to the RN-BSN Residency program may be eligible for full tuition remission in exchange for completing three years of employment at George Washington Hospital. Students who wish to pursue a Master of Arts (MA) in Education degree can choose from programs in educational leadership and administration, educational technology and leadership, rehabilitation counseling, and special education for culturally and linguistically diverse students. Doctor of Nursing Practice (DNP) programs are available in adult-gerontology primary care, health care quality, nursing education, nursing practice, and palliative care nurse practitioner. Part-time and full-time plans of study are available in these programs. A Doctor of Engineering in Engineering Management degree is offered online, as well as Doctor of Philosophy (PhD) programs in systems engineering and in engineering management. Through its School of Continuing Studies, Georgetown University offers online master's degree programs in technology management, real estate and sports industry management. Online programs taken through the School of Continuing Studies have no on-campus residencies, but online students are welcome to visit the campus. Additionally, Georgetown's McDonough School of Business offers an online Master's in Finance (MSF) degree, and Georgetown's School of Nursing & Health Studies offers a Master of Science degree in Nursing. Georgetown's Law School also offers several certificates and degrees online, including an Executive LL.M in Securities & Financial Regulation, an Executive LL.M. degree in Taxation and a Masters of Studies in Law with a focus on Taxation. Online programs at The Catholic University of America lead to graduate degrees in fields such as nursing, social work, and theology. The university also offers a few online certificate programs. Online nursing options include Master of Science in Nursing with a family nurse practitioner track, Doctor of Nursing Practice, and Ph.D in Nursing. The online M.S.N. program does not accept applications from residents of Washington, D.C., Maryland, and some counties in Northern Virginia and requires students from those areas to attend on-campus M.S.N. classes. The online Master of Social Work prepares candidates for licensure in clinical social work and does not require applicants to have majored in social work as undergrads. Theology programs offered online include Master of Catechesis, Doctor of Ministry in Evangelization, Doctor of Ministry in Liturgical Catechesis, and Certificate in Christian-Muslim Relations. The Doctor of Ministry in Spirituality program is a three-year program that requires students to participate in a two-week, on-campus residency each summer. The Licentiate in Canon Law program combines online coursework with five summers when students must attend a two-month residency. The Certificate in Creative Teaching Through Drama can be earned completely online.